Through a variety of programs offered in flexible formats, Emerson's creative learning environment allows you to turn your passion into a professional pursuit. Energized by engagement with the creative life of Boston and Los Angeles, our students are independent minds from diverse backgrounds who develop their own personal voice and expertise in professions that profoundly shape society and culture in the 21st century. Emerson College offers educational programs that prepare graduate men and women to assume positions of responsibility and leadership in communication and the arts and to pursue scholarship and work that brings innovation to these disciplines. Established in 1880 as a small, regional school of oratory, Emerson has evolved into a diverse, coeducational, and multifaceted degree-granting institution with a liberal arts rather than conservatory orientation. But our mission and focus remain largely the same as it was in 1880: to explore and push the boundaries of communication, art, and culture and, thereby, to contribute to the advancement of society. Many of our 37,000+ alumni remain active participants in the life of Emerson. Although concentrated in Massachusetts, California, and New York, Emersonians can be found working in virtually every major media, entertainment, or arts enterprise across the country. 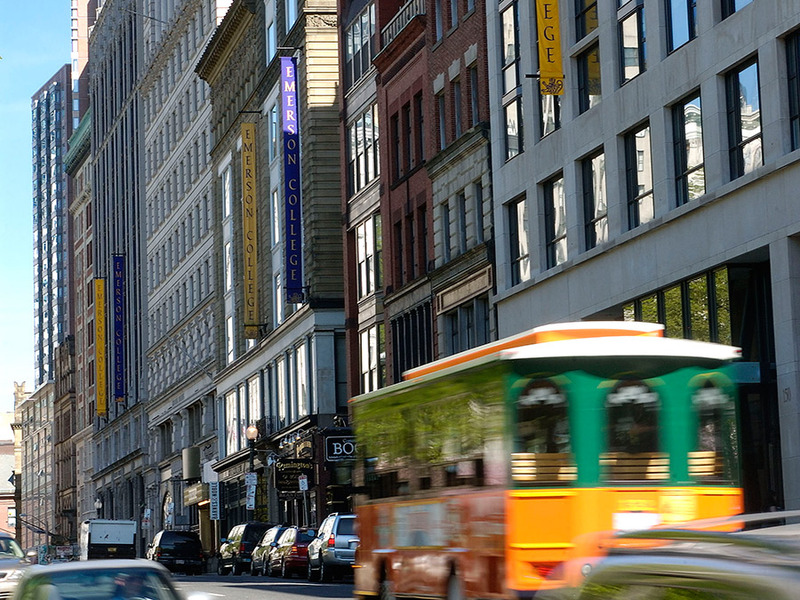 Emerson College’s main campus is located in the heart of Boston, Massachusetts, at the gateway of the city’s Theatre District and in close proximity to cultural centers, media outlets, and public transportation. The College also has facilities in Los Angeles. Explore and learn more about each of these locations by clicking the links below, or take a Virtual Tour of our Boston Campus now. Emerson’s epicenter is located at the intersections of Boylston and Tremont streets at the southeast end of Boston Common. The gold dome of the Massachusetts State House can be seen from many vantage points on campus and the subway stops at our front door. Located in the heart of Hollywood, ELA is an award-winning facility that houses up to 217 students and contains classrooms, offices, an auditorium, screening room, audio and video labs, performance and rehearsal studios, and more. The bill will reflect all costs charged to the student's account. These include tuition, board, and fees noted on the cost chart below, plus miscellaneous charges like transportation fees and finance charges, if applicable. For me information regarding student expenses, please click here. The MFA in Film & Media Art program seeks talented and ambitious students at all levels offering three entry points.